With help from their compatriots (including Neville Brand and L.Q. Jones), three Confederate brothers (Richard Egan, William Campbell, and James Drury) steal an army payroll from a train, unaware that the Civil War has just ended an hour earlier. Deciding to keep the cash as spoils of war, the brothers return home to their mother (Mildred Dunnock) and Egan’s sweetheart (Debra Paget), not knowing that Paget — believing Egan dead — has married their younger brother (Elvis Presley). When the feds catch up with Egan, he and his team must decide whether to surrender the money or stay on the run. 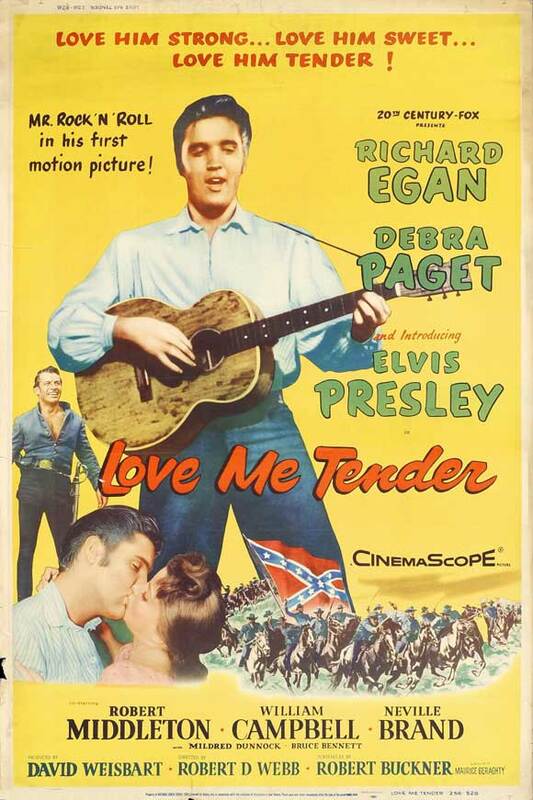 Elvis Presley’s debut film was rather uncharitably described by Bosley Crowther of the New York Times as “a slight case of horse opera with the heaves”. While it doesn’t quite deserve that level of disparagement, it’s true that not much distinguishes this tale from standard B-level oaters, other than the presence of Presley (and stellar Cinemascope cinematography). The storyline puts Presley in an unenviable position from the start: he’s clearly standing right in the way of Paget and Egan’s unrequited passion (their forlorn moon eyes are unmistakable), and his naive ignorance of their interest in one another posits him as an easily duped fool; meanwhile, his sudden transformation into jealous third wheel near the end of the film smacks of plot convenience. The songs Presley duly performs are noticeably patched into the script, and in one instance (when he gyrates his hips in front of an audience of bonnet-clad prairie gals) laughably anachronistic. No, though of course it maintains historical curiosity as Presley’s film debut. Listed as a Cult Movie in the back of Peary’s book. Not must-see, and in complete agreement with the assessment given. Still, Presley’s fans will no doubt check it out, or even revisit it. They’ll get the most out of it; otherwise, it’s not exactly classic cinema.